Dwayne "The Rock" Johnson shared a new photo of himself with co-star Karen Gillan in the Jumanji: Welcome to the Jungle sequel. For all those who have been waiting to watch the new sequel of 'Jumanji', here's some good news! After the success of 'Jumanji: Welcome To The Jungle,' the makers are ready to make another sequel for the franchise. The studio is in process of making the film and the cast is teasing the fans on social media. The picture reveals that the cast is clearly having a crazy time. 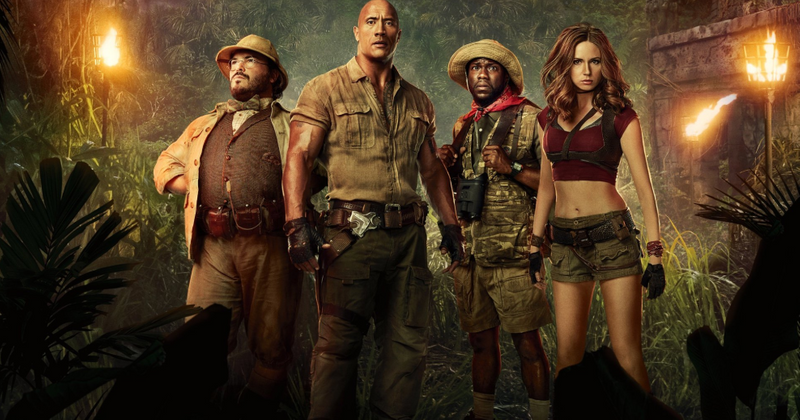 Recently, Dwayne "The Rock" Johnson shared a new photo of himself with co-star Karen Gillan with an "awkward" look in the Jumanji: Welcome to the Jungle sequel, as reported by ComicBook. The image shows Johnson and Gillan in their costumes looking like two teenagers in love. The fans are happy to see the two back in character and together on screen. The comments section is filled with compliments for the two actors and their looks. The actor captioned the picture with sweet words as he talks about getting back to the team for the sequel. "Shoot our new #JUMANJI with my partner in crime @karengillanofficial and if we look like two extremely awkward teenagers in love while trying to manage our insane superpowers in our JUMANJI universe - that's because we are," he wrote. "Absolutely love working and getting absurdly awkward with this gal. #RubyRoundhouse aka #KillerOFMen #DrSmolderBravestone #AwkwardTeenLove #JUMANJI THIS CHRISTMAS!" reads the caption. The new film is bringing back all the actors from the previous film who will be getting back to their roles. Apart from them, a lot of new actors are joining in, so we are soon going to be seeing a lot of new fresh faces. "From Awkwafina to Danny DeVito to now one of my action heroes, Danny Glover — it’s been awesome having so many actors and OG legends raise their hands wanting to come and play in our Jumanji universe," said Dwayne Johnson. "'Who turns into who?' will always be the fun magic sauce for our audience. "Jake Kasdan will direct again and the film is based on a script from Jeff Pinkner and Scott Rosenberg. Jumanji 3 is out in theaters on December 13.